Elektra #7 - Another issue missing the Michael Del Mundo which is its main selling point, but still has decent, more straightforward art by Alex Sanchez. The way Elektra defeats Lady Bullseye is the most weird and gross thing i've seen in a while, so points for that. One of my complaints about last issue was that Elektra defeated a whole bunch of cool villains off panel, and this issue sort of makes up for that by bringing some of them back. But they return mutated by the Assassins Guild so they are unrecognizable as classic villains, and the worst insult is that Elektra is facing off against Whiplash, Jack O'Lantern, and Tiger Shark and she says that Whiplash is the most dangerous. There's something really weird about fisticuff-level books nowadays where they are completely dismissive of super-powers. I mean, forget that fact that Tiger Shark is normally a Sub-Mariner/Avengers level villain. In this story he's mutated into a giant shark man. And Jack O'Lantern is a living ball of flame. You're telling me the guy with whips (albeit now four of them, and four arms to whip them) is the guy Elektra thinks is the most dangerous? I dunno; hoping Del Mundo comes back soon. You can figure it out but seems like unnecessary work on the reader's part. Beyond that i thought this was still good. The trial is being done well and Captain America is very much in character, surely to the annoyance of both She-Hulk and Daredevil. New Warriors #11 - I'm both relieved and disappointed that the Celestials aren't really coming. Disappointed because i thought it was going to be a cool story. Relieved for two reasons: 1) because the book is cancelled and however much time is left there probably wouldn't have been enough to do it just, and 2) because a Celestial visitation ought to not be limited to just the New Warriors book. Which says to me that this was probably the plan all along. Oh well. This issue had the team just getting stomped by the Eternals, so it was a little less "fun" than previous issues, but it was a good continuation. I take it that the High Evolutionary will be appearing in Uncanny Avengers when that book returns, and when asked if people should check out this book to see what the High Evolutionary has been up to, Tom Brevoort's response was Not especially, no. Marvel always was good at cross-promotion. Axis #3 - Having now read this i agree with Wanyas that the Sentinels being unable to defeat the villains makes no sense. I mean, Carnage can rip out one of their eyes, but the heroes couldn't do anything? I also agree with a good percentage of the internet that Remender is overly quippy and yet not very funny. There's no need for every villain to be so quippy. Dr. Doom even got in on it a little, responding to Loki's "No offense" with "None taken" which i know doesn't sound quippy but it is in context (Doom should not even acknowledge Teen Loki's flippancy!). All that said, i really enjoyed watching the villains stomp the Sentinels. It was a lot of fun. And maybe they just won because the heroes had already softened the Sentinels up or something. I also think Remender does write a fun and funny Deadpool (as he did in Uncanny X-Force). So minor quibbles about the scripting or how much better the villains did than the heroes aside, i was quite enjoying this. Until we got to the point where the Avengers and X-Men started fighting with each other. It was this bickering that had me eye-clawing myself during Remender's Uncanny Avengers run, and i see that literally no progress has been made. Ugh. Luckily that didn't last long. I am now looking forward to seeing exactly what Inverting means. Re:She-Hulk 9- I think the problem a lot of people had was that in real life trying to sue someone who was being held at gunpoint by criminals by claiming the criminals would have never shot another hostage if they had followed the criminals' instructions exactly wouldn't get very far. I think it works. It is a civil case, so it's really up to the jury. And Cap is not letting the case getting thrown out on technicalities; he wants to win "fair and square". This is because this story is really about his guilt over the incident; he wants to see if he can be absolved after all the evidence is weighed. 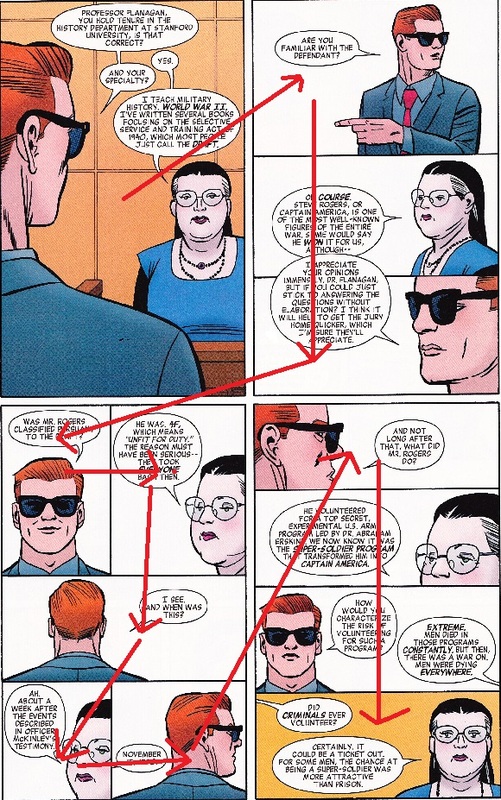 Matt Murdock is good enough to get a judge to accept the case especially if Cap is handicapping She-Hulk, and i'd say the outcome is uncertain because while on the one hand everyone on the jury knows Cap is a hero, on the other hand that may mean that they hold him to a higher standard, even when the incident was pre-hero. Elektra: the art in this book is less than adequate. drawing someone's mouth and nose off center is not enough to represent a person with their head turned. it just makes their face look crooked. the editing is bad. there are words and/or letters missing. either that or i don't understand the writing. "Stepping through Sidewinder's rift is diving headfirst into zero gravity." --i want there to be a "like" added after "is". they walk out of the rift, they don't fall out of it, so i am assuming she's using a simile and not saying it actually is diving. yeah, i know the difference between a simile and a metaphor, thanks. I think this series does very much have a surreal tone to it and i think it makes sense in that case for the characters to speak in metaphors. I think that works pretty well when it's Del Mundo on art and agree that it's incongruous with Alex Sanchez's more pedestrian style.